After a hearty breakfast at the Furano Prince Hotel, I said my goodbyes to Scott and reluctantly left Furano. My next destination was Tomamu. 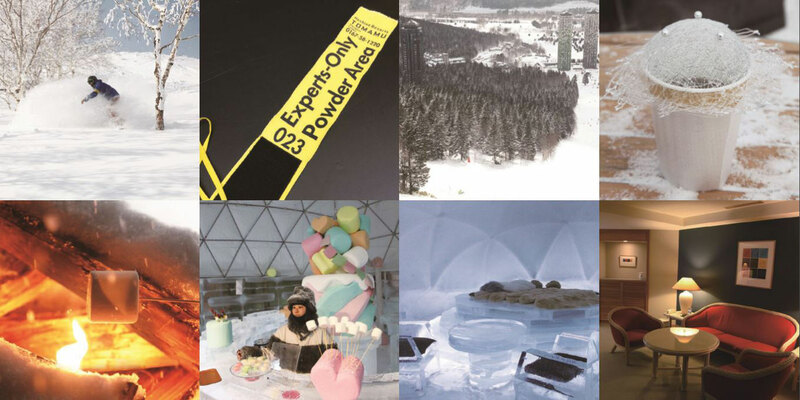 Tomamu is an independent ski resort operated by Hoshino Resorts, a renowned resort company in Japan. It is an enormous resort spanning 1000 hectares within beautiful natural surrounds housing; a hotel; up to 20 seasonal restaurants; The Church of Water – one of the three churches designed by renowned architect, Tadao Ando; Japan’s largest indoor wave pool – Mina-Mina Beach; and an outdoor hot spring – Kirin-no Yu, amongst its myriad of facilities. Tomamu can be reached by taking a simple route south, however, it is a fair distance away and took me over 2 hours by car. I’d spent all morning driving so I wanted to set off for the ski fields in the most efficient way possible when I reached Tomamu. Norio Kamibayashi, PR representative for the Hoshino Resorts ski areas, must have read my mind as he came to greet me on his snowboard when I reached the resort. of service. So, after I’d had a general run of the ski slope, I spent the rest of my time looking for untouched powder areas. Since I’d started my day of skiing in the afternoon, many powder areas had already been skied on by other people, but there was still so much left over. I had my fair share of brilliant powder snow runs that day. Even my guide, Norio, was in high spirits from being able to ski all he wanted that day. I spent the whole day skiing until the chairlifts stopped operating. As per my experience, there were plenty of courses to satisfy the needs of an advanced skier but at the same time, Tomamu has various different activities and facilities to keep even least enthusiastic skier occupied. This is something you could only expect from an independently run resort like this. As you alight from the gondola, you will arrive at the “Unkai Terrace” or “Sea of Clouds Terrace” and, as the name suggests, you will be treated to a spectacular sea of clouds. Many tourists flock there for the view rather than the ski experience. The Unkai Terrace is one of very few places on a snowy mountain top where you can experience such a view. Many tourists from Asian countries come just to stay in the mountain resort with no intention of skiing. According to Norio, a large portion of visitors don’t ski at all. I couldn’t imagine going to a ski resort with such magnificent powder snow and not skiing but, that only goes to show how excellent of a resort Tomamu is. There are two hotels located within the resort – The Tower and RISONARE Tomamu. The Tower stands at 121 metres tall with 36 floors housing a total of 535 guest rooms which can accommodate up to 5 people. There is WiFi throughout the building as well as a coffee lounge – Yukkuyukku, and other facilities to keep you busy. RISONARE Tomamu offers a more luxurious experience for those so inclined. It stands at 112.5 metres tall with 32 floors housing a total of 200 rooms. This means that there are only 4 rooms on each floor, extravagant to say the least. Fitted in each of the 100 metre square all-suite rooms of this gorgeous hotel is a jacuzzi with a view and a sauna. I happened to stay in one of these rooms on my trip and it truly was an incredibly luxurious experience. At night, you can treat yourself to a buffet filled with delicious foods made with Hokkaido-sourced ingredients at the forest restaurant surrounded by brilliant greenery, “Nininupuri”. For breakfast, you can stop by “Platinum” on the 32nd floor of RISONARE Tomamu and enjoy the wonderful views as you wish yourself a good morning. While there are plenty of other things to do outside of the hotel, such as a visit to the wave pool, I believe that the “Ice Village” deserves a special mention. This is one of very few places where you can visit a bar made completely out of ice amongst other icy structures. Tomamu is the perfect place to go if you’re looking for a lazy holiday at a resort. I sat in the jacuzzi of my luxurious hotel room as I reflected on my trip thus far. The last day of my stay in a ski area had finally arrived. I have a lovely breakfast at Hoshino Resorts Tomamu and then set off for Asahidake. I started my trip in Kamui, heading south to Furano and then further south to Tomamu. This time, I went straight up north towards Asahikawa. As I neared the city of Asahikawa, I turned and headed east towards Daisetsuzan. Daisetsuzan is a volcanic mountain range stretching across central Hokkaido with Mt. Asahidake standing as the highest peak in the range. Mt. Asahidake is the tallest mountain in Hokkaido and is known amongst some skiers and snowboarders as a holy ground for backcountry trails. I knew I had to see it for myself and put all of my focus into driving but, the closer I got to the mountain the more violent the blizzard winds became. Although my sight was frequently obstructed by the snow, I somehow managed to reach the foot of Mt. Asahidake. From a general point of view, Mt. Asahidake is a rather small ski slope with only two ropeways operating. But the view from the lift stop, accentuated by the plumes of smoke dotted along the place, was absolutely captivating. The main attraction to this ski slope was none other than the backcountry trails. In order to completely enjoy backcountry trials, you need do a little hike from the lift stop, so a guide familiar with the courses is essential.